Alleppey and Kumarakom are the most popular backwater destinations in Kerala. Adorned with serene beauty, these backwaters will definitely entice you. 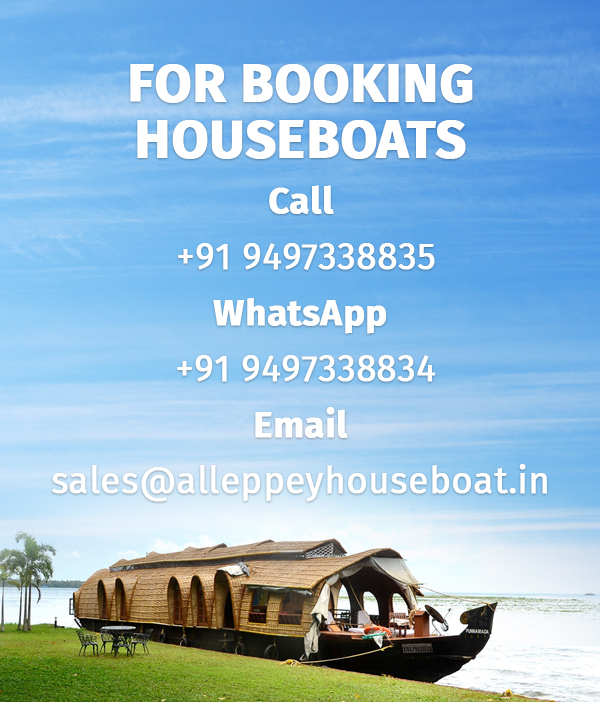 There are a number of backwater routes that you can opt for your houseboat cruise in Alleppey and Kumarakom. Here is a list of the most popular routes. Houseboats or Kettuvalllams as they are locally known, are traditionally cargo boats which carried rice and spices in the past when roadways were not as developed, and boats and canoes were the sole mode of transportation to and from the remote villages scattered across the backwaters of Kerala. Today these boats have been modified to in order to accommodate guests on board and satisfactorily tend to their comforts. Bedrooms with attached bathrooms, living area, kitchen, viewing decks etc are now made available on these boats. Guests stay on board these vessels while they cruise along the backwaters enjoying the beauty and tranquillity that they lack from their lives in the busy cities. Alleppey Round is one of the busiest houseboat routes and the most preferred by tourists who do not have more than a day to spare. Chosen mostly for Alleppey day cruises, it is also chosen as an overnight cruise as well. This route is always dotted by houseboats all along the way. On the cruise you will sail past the 11th century Buddha statue locally known as the Karumadikkuttan. One can also enjoy the beauty of sprawling paddy fields spreading a green hue as far as eyes can see. The cruise also covers picturesque villages of Champakulam, Nedumudi etc. Mostly preferred for weekend cruises and by honeymooners, Alleppey- Kumarakom route is very popular amongst tourists. The added benefit of being able to cover both the destinations at one go is certainly an advantage. Tourists can choose to board from Alleppey and end the cruise at Kumarakom and vice versa at a nominal fee. Pathiramanal islands and the Kumarakom bird sanctuary are noteworthy attractions on the route. A small island located around 1.5 kilometres from the Muhamma Jetty in Alleppey, Pathiramanal is a scenic and romantic location. The Kumarakom bird Sanctuary is a converging space for migratory birds and attracts tourists and bird watchers from around the globe. One gets to see all this and much more on this route. Alleppey Thottappally backwater route is one of the most sought-after cruise routes. You will sail across the famous Punnamada lake, past the Karumadikkuttan statue, Champakulam church, Ambalappuzha temple, Chavara Bhavan etc. One will get to unwind and relax while experiencing the tranquil waves and the cool breeze. Observing the activities of rural life, whose lifeline is these waters will not only occupy your time but also amaze you at its simplicity and rootedness. The lengthiest houseboat cruise routes in Kerala, Alleppey – Alumkadavu back water route is dotted with scenic locations and breath-taking views. It is ideal for weekend backwater cruises. You will cover a large portion of Kerala’s backwater stretches on this cruise. Alumkadavu is a village located just around 20 kilometres from Kollam. Enroute you will get to see the Pallathuruthy canal, Kanjipadam, Kayamkulam pozhi, Amritanandamayi Ashram etc which are the major attractions on this route. If you have a weekend to spare this is an ideal route for you as you get to enjoy almost the full length of Kerala’s backwater map. Set in the backdrop of Vembanad lake, the largest lake in Kerala, Kumarakom is not just home to a wide variety of flora and fauna but also to the famous Kumarakom bird sanctuary. Spread over 14 acres on the southern bank of Kavanar river Kumarakom bird sanctuary is known for being a haunt of migratory birds. Ideal for both day cruises and overnighters this is a very busy cruise route. A cruise along these waters will get you in close quarters with the magnificent birds that flock to this sanctuary. PreviousPrevious post:Top 10 Luxury houseboats in Alleppey KeralaNextNext post:How to book a houseboat in Alleppey Kerala?